For the language, see Alutiiq language. Not to be confused with Aleut people. 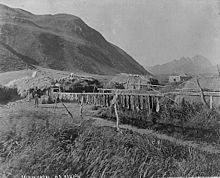 The Alutiiq people (pronounced /əˈluːtɪk/ in English; from Promyshlenniki Russian Алеутъ, " Aleut";    plural often "Alutiit"), also called by their ancestral name Sugpiaq ( /ˈsʊɡˌbjɑːk/ or /ˈsʊɡpiˌæk/; plural often "Sugpiat"), as well as Pacific Eskimo or Pacific Yupik, are a southern coastal people of Alaska Natives. 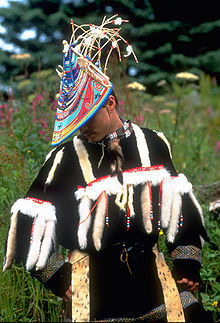 They are not to be confused with the Aleuts, who live further to the southwest, including along the Aleutian Islands. The people traditionally lived a coastal lifestyle, subsisting primarily on ocean resources such as salmon, halibut, and whale. They supplemented these maritime foods with rich land resources, such as berries and land mammals. Before contact with Russian fur traders, they lived in semi-subterranean homes called ciqlluaq. Today, in the 21st century, the Alutiiq live in coastal fishing communities in more modern housing. They work in all aspects of the modern economy, while also maintaining the cultural value of subsistence. 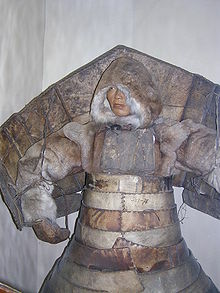 Cungagnaq, also known as Peter the Aleut, an Eastern Orthodox saint, reportedly from Kodiak Island. 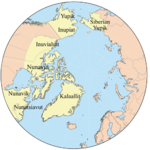 ^ Michael Krauss: "Alaska Native Languages in Russian America." In: Barbara S. Smith & Redmond J. Barnett, Russian America: The Forgotten Frontier, pp. 205–213. Washington State Historical Society, Tacoma, WA, 1990. ^ "2007 Fellows Individual Pages - MacArthur Foundation". Archived from the original on 2012-03-15. Retrieved 2018-10-14. Braund, Stephen R. & Associates. Effects of the Exxon Valdez Oil Spill on Alutiiq Culture and People. Anchorage, Alaska: Stephen R. Braund & Associates, 1993. Lee, Molly. 2006. ""If It's Not a Tlingit Basket, Then What Is It? ": Toward the Definition of an Alutiiq Twined Spruce Root Basket Type", Arctic Anthropology. 43, no. 2: 164. Mishler, Craig. 1997. 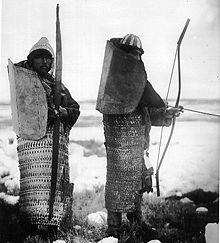 "Aurcaq: Interruption, Distraction, and Reversal in an Alutiiq Men's Dart Game", The Journal of American Folklore. (Vol. 110, no. 436): 189-202. Mishler, Craig. 2003. Black Ducks and Salmon Bellies: An Ethnography of Old Harbor and Ouzinkie, Alaska. Donning Company Publishers. Distributed by the Alutiiq Museum & Archaeological Repository, Kodiak, Alaska. Mishler, Craig, and Rachel Mason. 1996. "Alutiiq Vikings: Kinship and Fishing in Old Harbor, Alaska", Human Organization : Journal of the Society for Applied Anthropology (Vol.55, no. 3): 263-269. Simeonoff, Helen J., and A. L. Pinart. Origins of the Sun and Moon Alutiiq Legend from Kodiak Island, Alaska, Collected by Alphonse Louis Pinart, March 20, 1872. Anchorage, Alaska (3212 West 30th Ave., Anchorage 99517-1660): H.J. Simeonoff, 1996. "The Afognak Alutiiq People: Our History and Culture" (PDF). Afognak Native Corporation. 2008. Archived from the original (PDF) on 2013-11-13. Retrieved 2014-11-15. "Afognak Village Timeline". Afognak Native Corporation. Retrieved 2014-11-15. East Prince William Sound Landscape Assessment. "East Prince William Sound Landscape Assessment" (PDF). Ben Fitzhugh (2003). The Evolution of Complex Hunter-Gatherers: archaeological evidence from the North Pacific. Kluwer Academic/Plenum Publishers. United States Census Office (1893). "Report on Population and Resources of Alaska at the Eleventh Census: 1890". Sven Haakanson (2010). Written Voices Become History. Left Coast press. Jacob Resnick. "Kodiak High School Adding Alutiiq Language Class". Alaska Public Radio Network. Laurie Shannon Richmond (2011). Regulating a Mystery: Science, colonialism, and the politics of knowing in the Pacific halibut commons (PDF). Archived from the original (PDF) on 2013-01-24.